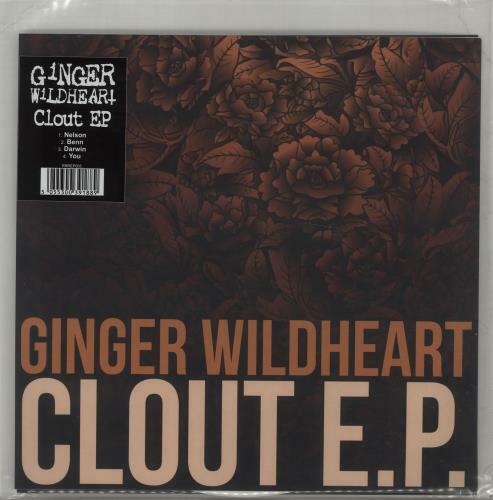 GINGER WILDHEART Clout EP (2017 UK limited edition 5-track 10" single originally issued in 2015 as a free download in the Songs & Words Pledge campaign and now available on WHITE VINYL exclusively for Record Store Day. The concept for the four songs was to concentrate on real life heroes, ones that Ginger and producer Jase Edwards considered truly inspirational figures. They chose Tony Benn, Charles Darwin, Horatio Nelson and, you, the one able to carry on the greatness handed down by the greats. Housed in a title-stickered clear polythene bag, the vinyl comes accompanied with five bonus 10" art prints! RRREP005). or visit our Ginger (Wildhearts) image gallery.